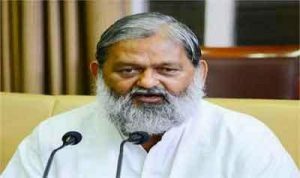 Chandigarh: Haryana Health Minister Anil Vij will launch a mobile application and release a book titled ‘Standard Operating System’ based on Hepatitis C at Red Bishop in Panchkula. The mobile application would provide information related to health services to doctors in the state. While stating this here, Director General, Health, Dr. Satish Aggarwal said that Health Minister would participate in the state level seminar on Hepatitis C to be organised by the Department tomorrow. He said that this mobile application would help in promptly updating doctors in the state with new schemes of the State Government and other information. Apart from this, the book that comprises a flowchart of treatment and prevention of Hepatitis C which would be helpful in treatment of patients. Dr Aggarwal also added that Principal Secretary of the Department, Amit Jha, Nodal Officers of Hepatitis C in all districts of the State, and senior officers of Central Government would also participate in the seminar.